Heavy rains since Sunday morning flooded several settlements in different parts of Kathmandu Valley. The rain-swollen Nakkhu, Manohara, Bagmati, Dhobikhola and Bishnumati rivers spilled over their banks, flooding the nearby settlements. Squatter dwellings at Shantinagar, Baneshwor, Teku and Balkhu areas in Kathmandu were immersed in knee-deep waters as a result of flooding. At Shantinagar and Balkhu, floodwaters travelled past the squatter hutments hemming the riversides and entered into private properties. More than 20 homes were inundated as a result. In Lalitpur district, scores of homes were flooded, particularly at Tikathali, Sano Gaun and Lubhu. Waterlogging affected those homes that were either situated close to a water body or on low-lying areas without proper drainage system. The raging Godawari River swept away a car in Lubhu. In some neighbourhoods, the river waters swamped roadways disrupting traffic and public movement. 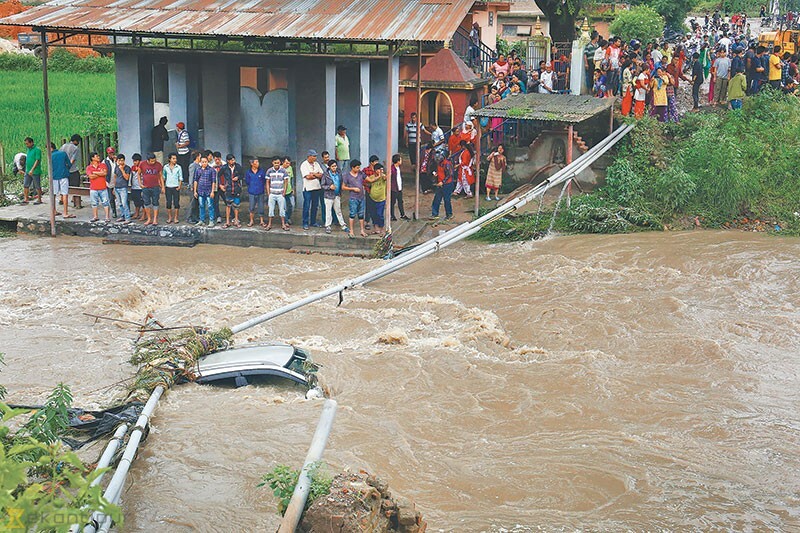 Chief District Officer Premraj Joshi said vehicular movement was also disrupted in Lakuri Bhanjyang, Bhatte Dada and other parts of Lalitpur owing to floods and landslips. Bhaktapur was once again hit by flood after last month’s disastrous deluge that had temporarily displaced more than 3,000 residents and cost millions of rupees in damage. Many homes, business establishments and roads were once again submerged in floodwaters on Sunday. The only consolation for the flood-affected residents was that it was not bad as the last one. According to the Meteorological Forecasting Division (MFD), the Kathmandu Valley received 50.3 mm rainfall in the last 24-hours. Sameer Shrestha, meteorologist with the MFD, said the intensity of rains would start subsiding in the eastern part of the country from Tuesday onwards. The same phenomenon is to be expected to occur in the western region from Wednesday. Parts of eastern and central regions are likely to witness heavy rains on Tuesday, according to the MFD.